The PB100-15 Pro Bass Combo features the heavy-duty PS15 400 watt 15" woofer for louder & deeper bass response down to 41 Hz. Unlike other small amps, these are loud, powerful 100 Watt models delivering their full power into an 8ohm speaker-not 4ohm. Because they are built for professional users features include; 3 pre-shape filter buttons for contouring the initial sound from your pickup, shelving bass & treble tone controls with a parametric sweep control for those important mid range frequencies, effects loop, variable compressor that limits peaks and a noise gate to quiet any hum from your pickup. The 160 Watt Carvin PB200-15 Pro Bass Combo features the compactness of a portable bass rig with the power required for the stage. The tuned 15" ported bass reflex enclosure includes a tweeter with its own control for slap or acoustic bass playing. This compact studio bass amp features the heavy-duty PS15 400 watt 15" woofer for its deep bass down to 41 Hz. Professional features in addition to those found on the PB100-15 above include a post 5 band graphic EQ. They've created a bi-amped monster, the RL6815 Cyclops 600W 1x15, 2x8 Bass Combo Amp! Carvin have combined the Series III R600 bass head, a heavy duty 15 inch woofer, and two 8 inch mid-range drivers, as well as the "RedEye" compression horn driver into a custom tuned, bi-amped enclosure to create the finest "combo" bass amp ever made! The R600 amp head uses the same high-powered technology found in Carvin's highly acclaimed DCM Series power amplifiers. The 600 watt RMS power rating is very conservative. The cabinet is computer-tuned to its drivers for a perfectly matched system. The "Cyclops" will pound out club-filling bass all night, every night, and still fit in the trunk or back seat with ease. 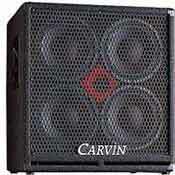 Carvin's RedLine Series bass amplifiers and cabinets are quite simply, the best available at any price. The new Series III amp has been redesigned internally while maintaining the same classic look that made the Redline amp one of the leading designs in pro bass amplification. The Redline series amps are some of the most powerful and versatile amps available. You can run dual mono full range, stereo full range, or bi-amped at the touch of a button! Loaded with stacks of features, click the info button to find out more! The RL118 Bass Box features our heavy-duty cast frame, 800 watt, 18 inch woofer in a computer tuned, front shelf ported cabinet. High output and deep, earth shaking bass are easily achieved without breaking up or bottoming out. It's great as part of a bi-amped system with the RL410T or RL210T top cabinets. The RC210 "Red Eye Combo" features the Series III R600 amp head. 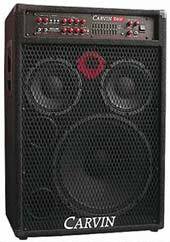 This combo packs 600 watts (bridged full range) of pure punch into 2 heavy duty 10" drivers and "red eye' horn. The tilt back cabinet design allows easy access to the face of the amp while directing sound at an upward angle for on-stage monitoring.The RC210 is also an awesome high-powered acoustic amp! For those who want all the quality and performance of the "RedEye" (RL410T), but at about half the size and weight, the RL210T Bass Box is just right. It has the same compression driver and crossover network, including an adjustable tweeter, as its bigger brother and will complement a sub woofer set-up or work great as a stand-alone unit. You will be pleasantly surprised by the solid output of this compact cabinet! With the RL410T 4 x 10 Bass Cabinet your sound will be crisp and clear even at the highest sound pressure levels. When you yank that G string four inches off the fretboard or slap that E or B string, you won't get that distorted fork-on-plate sound that you get from lesser speakers. You will get clean, punchy, uncolored bass guitar reproduction. And this is true of the midrange and low end as well. The cross-over design incorporates a fully adjustable L-Pad and exciter lamp tweeter protection. Front shelf ported for a full, deep sound.